Meet Mik, aka Mik the Lick. He has officially made whipping out his tongue to lick your face or any other available body part an Olympic event. 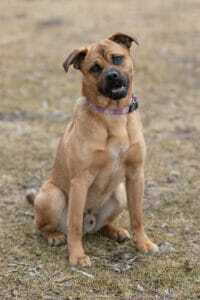 Mik is a Pug x Labrador mix or what I call a Pugador = pugador-able. This handsome red with black highlights fella is between 10 months & a year old. He weighs in at about 18 kg (40 lbs), so he’s a medium size dog. 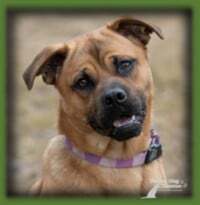 He came to Pound Dog Rescue as an unclaimed stray – seriously! Someone did work with him though. He has the best sit, comes when called, shakes a paw, likes having his ears cleaned & his teeth brushed, loves massages, being toweled off, & will even try to cuddle (until he gets too hot). He just doesn’t have much experience on a leash. Mik is very active. He’s a high energy dog! Racing around the yard and taking part in a good play session with his foster sister are his favourite pastimes. He is also happy on his own cruising about the yard looking for things to chew or chase, or inside with something good to chew on. Mik is housetrained. He will come to you, and then go to the door to let you know he has to go out. If you aren’t cluing in, he will bark to let you know it’s time. He loves his walks and has become pretty good on leash. He is quite good on leash when it’s just the two of us. However, he pulls a bit when we go with his foster sister. He is still quite determined to chase after anything furry or feathered that moves, & pulls to go after them. Mik also barks & pulls when he sees other dogs. He doesn’t quite know how to control his excitement yet. He doesn’t want to hurt them; he just doesn’t know how to react. Consequently, he is walked with a gentle leader head harness to help him remember his leash manners & not to pull. He gets better with each walk. Mik is a smart fellow & learns quickly. He is very easy to train & he loves to learn. Basically, he loves to please you. Mik just wants to be with you. As I write this bio, he is lying beside me. He is my shadow, following me all over. I’m sure there are days he wishes I’d just sit down. No sooner does he find a comfy spot than I move, so he has to get up & follow me, nestling into the next comfy spot for a nap, only to have me move somewhere else. His desire to be with you does result in some separation anxiety when he is in the crate & you leave the room. He is very barky in the crate when you aren’t around. After his neutering, we didn’t crate him because the space was too small for his satellite dish sized cone. He doesn’t bark much if at all when you leave the room & he is out of the crate. He is crated in the car & is quite content & relaxed – he loves car rides. We suspect that he would be fine in the crate if it was in your bedroom or somewhere near you so he knows that you are close by. For the most part, he is pretty good having free run of his space. He does pick up footwear & relocate it but has never chewed it. He hasn’t chewed furniture, trim, drywall, or anything structural. However, he does seem to like to chew paper products. He is a counter surf though, so we have found things that have had food in or on them taken off the counter & chewed. He only counter surfs when you aren’t around. until he is released before he can leave. He is working on leave it, down, & off. He retrieves toys & loves a good tug. He’s pretty good at releasing his toys when given the drop command. He likes to learn & learns quickly. He is a delight to train. BTW, he is food motivated with lovely meaty type treats. We have found some treats that he just spits out. They were super hard. He also doesn’t care for super hard toys, so he may have a somewhat discerning pallet based on crunchability. Mik has a very strong prey drive. He will stand at windows or doors to bark at squirrels outside. He races to the fence to bark at creatures in other yards. He barks at other dogs on the street or when you’re walking him. 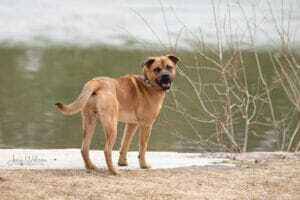 His prey drive could result in him running away if he were to get out of the yard or off leash. He tests the door to see if it’s properly latched & does sneak out as it is closing. As a result, he will require a securely fenced yard, & you need to be confident that your family doesn’t leave doors or gates open. He is not possessive of food, treats, or toys. He lets you put your hand in his food dish or take the dish away. He releases toys when asked. Mik enjoys being outside. He likes the cool weather. He loves chewing sticks, logs, shrubs, Hydrangea. He dreams about taking his lovely soft plush toys outside for a relaxing chew in the mud (only in your dreams buddy). He loves eating ice/snow & will dive head first into deep snow to plough his way around. He sneezes when he goes outside into the cold. He loves rubbing his entire body & face on shrubs. His love for rubbing makes vacuuming a challenge, & you’ll be vacuuming a lot when he’s shedding. He enjoys being vacuumed & will arrive with a toy or something (today it was my shoe) to get your attention so you just have to run the brush over his back, then he flops onto his side for the underbelly rub. Remember, he’s Mik the Lick. Well, he licks at the end of the hose when you have the brush attachment off. He needs lots of exercise. Mik is a high energy dog. He would be a great hiking, running or biking partner. He will need a home with an active lifestyle; a home where he can be physically and mentally stimulated every day. His routine is a 1.25 hour walk in the morning and a 1 hour walk in the evening, plus play time with his foster sister. He will need a large securely fenced back yard. He is not suited to apartment, condo or townhouse type living due to his barking & his need for exercise & outdoor stimulation. 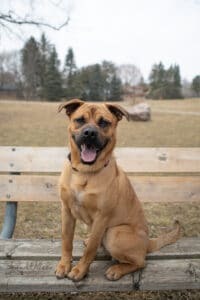 Mik is good with other dogs (even though he barks at them when he sees them – working on that) and will do well in a home with or without another dog. He is not fostered in a home with a cat, but his strong prey drive suggests that he may not be suited to living with a cat. He likes people and is very happy to have someone come to visit him. Mik doesn’t live with children. His prey drive & youthful exuberance could result in him chasing young children when they run. A home with children over the age of 12 or with dog savvy children would be best. If you cannot ensure that doors will always be properly closed, Mik is not the dog for you because he tests doors to see if they are open & he could escape. With Mik the Lick in your life, you have to be a fan of dog goober kisses from this happy, busy fellow. 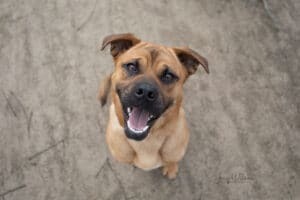 You also will need to take him to Level 1 Obedience as a minimum to build your bond with him, and continue shaping him into the magnificent, charming fellow that he is.